The first mention of A London Symphony is in a letter from Vaughan Williams to the folk-song collector Cecil Sharp in July 1911. ‘I am in the middle of a great work’, he wrote, ‘& unless I get stuck in it I don’t want to leave it’. This suggests he may even have begun to compose it as early as 1910. His friend the composer George Butterworth had urged him to write a symphony, so some sketches for a symphonic poem about London were looked out and ‘thrown into symphonic form’. The day after the first performance on 27 March 1914, Butterworth wrote to VW that he was ‘frightfully glad’ that ‘you have at last achieved something worthy of your gifts … I really advise you not to alter a note of the Symph. Until after its second performance (which is bound to come soon)—the passages I kicked at didn’t bother me at all, because the music as a whole is so definite that a little occasional meandering is pleasant rather than otherwise. As to the scoring, I frankly don’t understand how it all comes off so well, but it does all sound right, so there’s nothing more to be said’. The general critical reception of the symphony was favourable but the composer himself—according to the critic A.H. Fox Strangways—went about ‘asking friends to tell him what to cut out’. So it is clear that he was dissatisfied with it from the start. Within a week of the first performance, he had an inquiry from Paris about a projected performance at the Théâtre du Châtelet. There was also mention of an Edinburgh performance. Neither materialised. At some point in this period, the manuscript full score was sent to Germany, whence it never returned. Butterworth organised a reconstruction from the original parts with the help of Vaughan Williams, E. J. Dent, and Geoffrey Toye (who had conducted the first performance). This score was used on 18 February 1918, when Adrian Boult conducted and the composer, on leave from the army, was present. After this the long process of revision began. Boult planned a repeat performance for 18 March and Vaughan Williams wrote to him late in February: ‘I agree with you that the last movement & possibly the scherzo … are too long—but it is re-writing they want—I do not think that mechanical cutting, however skilfully done, wd. Be satisfactory’. More revisions were made for a performance conducted by Albert Coates on 4 May 1920. This was followed by publication of the score in the same year. It carried a dedication to the memory of Butterworth who had been killed in action in 1916. Further revisions were made in 1933 (‘some of the bad bits were cut out’, V.W. said) and a few more in 1934. The revised full score appeared in 1936. Performance and recording of the original 1913 score were authorised not long before her death in 2007 by Vaughan Williams’s widow Ursula. The restored cuts amounted to 20 minutes of music, some of it very fine. Vaughan Williams said that the Symphony ‘must stand or fall as “absolute” music’ and that a better title might have been ‘Symphony by a Londoner’ (he composed most of it in his home in Cheyne Walk, Chelsea, with its superb view of the river). In an article written in 1912 while he was working on the symphony, he asked: ‘Is it not possible that the English composer has something to say to his own countrymen that no-one of any other age and any other country can say? Have we not all about us forms of musical expression which we can purify and raise to the level of great art?’ In this symphony street cries, the Abbey chimes, the Cockney’s mouth-organ and accordion, are raised to the level of great art. Mahler would have approved. 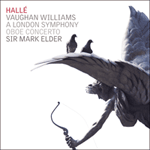 The influence of Debussy and Stravinsky can be detected, also—though less obviously—that of Elgar, whose evocation of late-Victorian London in Cockaigne (1901) is celebratory where Vaughan Williams is generally tragic and sombre although his orchestration is as vivid. When in 1951 he revised the scoring of his then existing six symphonies, he omitted the London, telling Sir John Barbirolli that it was ‘past mending though indeed with all its faults I love it still—indeed it is my favourite of my family of six’. The slow, quiet introduction to the first movement depicts dawn, with London ‘lying still’, as Wordsworth saw it. Harp and clarinet sound the half-hour of the Westminster chimes, the music wakes to busy life and the main allegro section begins with one tune after another scurrying along. A declamatory second subject (woodwind and brass) leads into a high-spirited episode and this is followed, after a brief return to the material of the first subject group, by a quiet, delicately scored passage which perhaps depicts a church or one of London’s parks. The movement ends with a grandiose restatement of the second subject. Vaughan Williams likened the slow movement to ‘Bloomsbury Square on a November afternoon’. Against a background of wide spaced chords on the strings, the cor anglais plays a melancholy tune marked misterioso. This opening passage is repeated in E major scored for harps and trombones and with a horn taking over from the cor anglais and sounding the rising fourth which is a thematic feature of the introduction to the first movement. Viola and woodwind have a dialogue which quotes a lavender-seller’s cry and the jingle of hansom cabs is heard. The music now becomes restless and eerie and rises twice to a passionate climax. As this subsides, the main themes of the movement are heard again and the solo viola closes the movement poetically. The scherzo is perhaps the most picturesque movement and is the most heavily revised. It begins vivaciously with fragments of themes tossed about in the orchestra. A fugato section is more portentous. The scherzo section is repeated and a bassoon links it with the trio (in C major) in which a convivial Cockney scene, centred on a mouth-organ (muted horns) and piano accordion, is vividly evoked. The high spirits yield to a more sombre and almost sinister treatment of the principal themes. Horn and violin solo continue this elegiac vein and the movement ends in reflective mood. The finale opens with a tragic appassionato theme like a cry of despair. Cellos introduce a slow march theme which leads directly into an animated allegro section dominated by a solemn theme for strings and horns. Undoubtedly some grimmer aspect of city life—the hunger marches, the slums—is the inspiration of this part of the symphony. The march theme is worked up to an impassioned climax, its final statement being crowned by a stroke on the gong. The Westminster Chimes sound the third quarter and the Epilogue begins with a rippling figure which tells us that the Thames is its subject. The composer said that this Epilogue was suggested by a passage in H. G. Wells’s novel Tono-Bungay where London is described as seen from a warship sailing down the river towards the sea: ‘To run down the Thames so is to run one’s hand over the pages in the book of England from end to end. The old cries and the old devotions glide abeam, astern, sink down upon the horizon, pass—pass. The river passes—London passes, England passes …’ Fragments of earlier themes are recalled and, after a final elegiac violin solo and solemn chords, the music swells to a quiet end—and a prophetic one, too. Six months after the first performance England was at war with Germany and the 42-year-old composer of A London Symphony had enlisted in the army. La première mention de A London Symphony apparaît dans une lettre de Vaughan Williams au collectionneur de chansons populaires Cecil Sharp en juillet 1911. «Je suis au milieu d’une grande œuvre», écrivait-il, «et à moins de m’y retrouver englué, je n’ai pas envie de la quitter». Ceci donne même à penser qu’il en entama peut-être la composition dès 1910. Son ami le compositeur George Butterworth le poussait à écrire une symphonie, aussi ressortit-il quelques esquisses écrites en vue d’un poème symphonique sur Londres pour les «jeter en forme symphonique». Le jour qui suivit la création du 27 mars 1914, Butterworth écrivit à Vaughan Williams: «Je suis vraiment enchanté que vous ayez enfin réalisé un morceau à la mesure de votre talent … Je vous recommande vivement de ne pas changer une seule note de la Symphonie avant qu’elle ait été donnée une seconde fois (ce qui ne saurait tarder)—les passages que j’ai un peu critiqués ne m’ont pas du tout dérangé, car la musique dans son ensemble est si assurée qu’une petite digression occasionnelle est plus agréable qu’autre chose. Quant à l’orchestration, franchement je ne comprends pas comment elle passe si bien, mais elle sonne vraiment juste, alors il n’y a rien à ajouter». Dans l’ensemble, la symphonie rencontra un accueil critique favorable, mais le compositeur lui-même—à en croire le critique A. H. Fox Strangways—n’eut de cesse de «demander à ses amis ce qu’il fallait retrancher», aussi est-il clair que d’emblée, il ne fut pas satisfait de son ouvrage. Moins de huit jours après la création, on lui proposa d’en donner une exécution au Théâtre du Châtelet de Paris. Il fut également question de la jouer à Edimbourg. Aucun de ces projets ne se matérialisa. A cette époque, le manuscrit de la partition intégrale fut envoyé en Allemagne, d’où il ne revint jamais. Butterworth la reconstitua à partir des parties instrumentales originales avec l’aide de Vaughan Williams, de E. J. Dent et de Geoffrey Toye (le chef d’orchestre de la création). C’est cette partition qui fut utilisée le 18 février 1918, lorsque Adrian Boult dirigea l’ouvrage, en présence du compositeur, alors en permission. Après quoi, le long processus de révision commença. Boult programma une nouvelle exécution pour le 18 mars et Vaughan Williams lui écrivit fin février: «Je suis d’accord avec vous, le dernier mouvement, et sans doute le scherzo sont trop longs—mais ils ont surtout besoin d’être réécrits—je ne pense pas que des coupures mécaniques, aussi habiles soient-elles, puissent suffire». De nouvelles révisions furent apportées en vue d’une exécution dirigée par Albert Coates le 4 mai 1920, suivies, cette même année, de la publication de la partition. Elle était dédiée à la mémoire de Butterworth, tombé au champ de bataille en 1916. La partition fut encore remaniée en 1933 («certains des passages ratés ont été coupés», déclara Vaughan Willliams), puis en 1934. La partition révisée complète parut en 1936. L’exécution et l’enregistrement de la partition originale de 1913 furent autorisés par Ursula, la veuve du compositeur, peu avant sa disparition en 2007. Les coupures restaurées correspondaient à 20 minutes de musique, don’t certains très beaux passages. Vaughan Williams déclara au sujet de sa Symphonie qu’elle devait «s’ériger en tant que ‘musique absolue’ ou s’effondrer» et qu’il aurait dû l’intituler «Symphonie d’un Londonien»—il en composa la majeure partie à Cheyne Walk, dans le quartier de Chelsea, avec sa splendide vue de la Tamise. Dans un article écrit en 1912 alors qu’il travaillait à sa symphonie, il s’interrogeait ainsi: «N’est-il pas possible que le compositeur anglais ait quelque chose à dire à ses compatriotes qui n’a été dit à aucune autre époque et en aucun autre pays? Ne sommes-nous pas tous environnés de formes d’expression musicale que nous pouvons purifier et élever au niveau du grand art?» Dans cette symphonie, les cris lancés de par les rues, le son des cloches de l’abbaye, ou encore l’harmonica et l’accordéon cockneys, sont justement élevés à ce niveau. Mahler aurait approuvé. On peut aussi déceler l’influence de Debussy et de Stravinsky, mais aussi (moins évidente toutefois) celle d’Elgar, don’t l’évocation de Londres à la fin de l’ère victorienne dans Cockaigne (1901) est festive là où l’atmosphère de l’ouvrage de Vaughan Williams est surtout sombre et tragique, en dépit d’une orchestration tout aussi colorée. Quand, en 1951, le compositeur révisa l’orchestration de ses six symphonies alors achevées, il omit celle-ci, confiant à Sir John Barbirolli qu’on ne pouvait «plus y remédier, même si je l’aime encore malgré tous ses défauts—de mes six enfants symphoniques, c’est même ma préférée». La lente et calme introduction du premier mouvement dépeint l’aube, avec Londres «silencieuse et immobile», pour reprendre la description de Wordsworth. La harpe et la clarinette font sonner la demi-heure du carillon de Westminster, la musique s’éveille et s’anime et la section principale allegro débute avec une mélodie empressée. Un second sujet déclamatoire (bois et cuivres) mène à un épisode enjoué, lui-même suivi, après un bref retour au matériau du groupe du premier sujet, par un passage paisible à l’orchestration délicate qui évoque peut-être l’une des églises ou l’un des parcs de Londres. Le mouvement s’achève par une grandiose réaffirmation du second sujet. Vaughan Williams comparait le mouvement lent à «Bloomsbury Square un après-midi de novembre». Sur la toile de fond d’accords très espacés des cordes, le cor anglais joue une mélodie mélancolique marquée misterioso. Ce passage initial est répété en mi majeur par les harpes et les trombones et avec un cor relayant le cor anglais et jouant la quarte ascendante, trait thématique de l’introduction du premier mouvement. L’alto et les bois entament un dialogue citant l’appel d’un marchand de lavande et on entend tinter des fiacres. La musique est maintenant agitée et inquiétante, et elle atteint par deux fois un apogée passionné. Alors que ceux-ci s’effacent, résonnent à nouveau les thèmes principaux du mouvement et l’alto solo referme le mouvement avec poésie. De tous, le scherzo est sans doute le mouvement le plus pittoresque, et c’est aussi celui qui a subi le plus de remaniements. Il commence vivement, avec des fragments de thèmes ballottés d’un côté à l’autre de l’orchestre. Une section fugato se montre plus formidable. La section de scherzo est répétée et un basson la relie au trio (en ut majeur) dans lequel une scène cockney conviviale, axée sur un harmonica (les cors avec sourdine) et un accordéon, est évoquée de façon très imagée. L’enjouement cède la place à un traitement plus sombre, voire menaçant, des thèmes principaux. Le cor et le violon seul poursuivent dans cette veine élégiaque et le mouvement se clôt de manière songeuse. Le finale débute par un thème appassionato tragique, comme un cri de désespoir. Les violoncelles introduisent un thème de marche lente qui mène directement à une section allegro animée, dominée par un thème solennel confié aux cordes et aux cors. A l’évidence, c’est un versant plus sinistre de la vie citadine—les manifestations des populations affamées, les bidonvilles—qui a inspiré cette partie de la symphonie. Le thème de marche s’intensifie vers un apogée passionné, son assertion finale couronnée d’un coup de gong. Le carillon de Westminster sonne les trois quarts et l’Epilogue débute par un dessin ondoyant qui nous révèle son sujet, la Tamise. Le compositeur affirmait que cet Epilogue lui avait été inspiré par un passage du roman Tono-Bungay de H. G. Wells qui décrit Londres vue d’un vaisseau de guerre voguant sur le fleuve jusqu’à la mer: «Descendre la Tamise, c’est comme parcourir chaque page du livre de l’Angleterre. Les antiques cris et les anciennes dévotions glissent de la proue à la poupe, s’effacent vers l’horizon, passent, passent. Le fleuve passe, Londres passe, l’Angleterre passe …» Des fragments de thèmes précédents sont évoqués et, après un dernier solo de violon élégiaque et des accords solennels, la musique s’élève vers une conclusion apaisée … et prophétique. Six mois après la création de l’ouvrage, l’Angleterre était en guerre avec l’Allemagne et le compositeur de la London Symphony, alors âgé de 42 ans, s’était engagé dans l’armée. Die Reaktionen der Kritik waren im Allgemeinen positiv, doch laut dem Kritiker A. H. Fox Strangways kam der Komponist nicht zur Ruhe und „bat Freunde, ihm zu sagen, was er herausstreichen solle.“ Diese Aussage legt nahe, dass Williams von Anfang an unzufrieden gewesen sein muss. Binnen einer Woche nach der Uraufführung erhielt er eine Anfrage aus Paris bezüglich einer möglichen Aufführung am Théâtre du Châtelet. Auch eine Aufführung in Edinburgh war im Gespräch. Keine von beiden kam zustande. Irgendwann zu jener Zeit wurde das Manuskript der vollständigen Partitur nach Deutschland geschickt, von wo aus es nie wieder zurückkam. Butterworth organisierte eine Rekonstruktion auf Basis der ursprünglichen Einzelteile, mit Hilfe von Vaughan Williams, E. J. Dent und Geoffrey Toye (dem Dirigenten der Uraufführung). Diese Partitur kam am 18. Februar 1918 zum Einsatz; Adrian Boult dirigierte unter Anwesenheit des Komponisten, der sich auf Armeeurlaub befand. In der darauffolgenden Zeit begann ein langer Prozess der Überarbeitung. Boult plante eine weitere Aufführung für den 18. März. Williams schrieb ihm gegen Ende Februar: „Ich stimme zu, dass der letzte Satz & möglicherweise auch das Scherzo … zu lang sind—aber sie müssten umgeschrieben werden—ich glaube nicht, dass ein schematisches Kürzen, wie kunstvoll auch immer es sein möge, zufriedenstellend wäre.“ Weitere Änderungen erfolgten für eine Aufführung am 4. Mai 1920, dirigiert von Albert Coates. Im gleichen Jahr wurde auch die Partitur veröffentlicht. Sie trug eine Widmung zum Andenken an Butterworth, der 1916 im Kampf gefallen war. Änderungen wurden erneut vorgenommen im Jahr 1933 („einige der schlechten Stellen wurden herausgeschnitten“, so Williams) und noch weitere im darauffolgenden Jahr. Die vollständige, überarbeitete Partitur erschien 1936. Aufführung und Tonaufnahme der Originalpartitur von 1913 wurden von Williams’ Witwe Ursula, erst kurz vor ihrem Tod, im Jahr 2007 autorisiert. Die restaurierten Aufnahmen ergaben zwanzig Minuten zum Teil sehr schöne Musik. Die langsame, ruhige Einleitung zum ersten Satz stellt das Morgengrauen dar, London „liegt still“, wie Wordsworth es fasste. Harfe und Klarinette spielen den halbstündigen Westminsterschlag, die Musik erwacht zu umtriebigem Leben und der allegro-Hauptteil beginnt, in dem eine Melodie der anderen hinterhereilt. Ein deklamatorisches zweites Thema (Holzbläser und Blechinstrumente) bildet den Übergang zu einer ausgelassenen Episode. Nach einer kurzen Rückkehr der ersten Themengruppe folgt eine ruhige, feinfühlig orchestrierte Passage, die vielleicht eine Kirche oder einen der Londoner Parks darstellt. Der Satz endet mit einer grandiosen Rückkehr des zweiten Themas. Vaughan Williams verglich den langsamen Satz mit „einem Novembernachmittag am Bloomsbury Square“. Vor dem Hintergrund weit auseinanderliegender Streicher-Akkorde spielt das Englischhorn eine melancholische Melodie, die mit dem Vermerk misterioso versehen ist. Diese Eröffnungspassage wird wiederholt in E-Dur und ist instrumentiert mit Harfen, Posaunen und einem Horn; es löst das Englischhorn ab und spielt die steigende Quarte, die ein thematisches Merkmal der Einleitung zum ersten Satz ist. Viola und Holzbläser treten in einen Dialog miteinander, der das Rufen eines Lavendelverkäufers zitiert, und auch das Zügelrasseln der Droschken ist zu hören. Die Musik wird nun rastlos und unheimlich und schwingt sich zweimal zu einem leidenschaftlichen Höhepunkt auf. Als dieser Teil ausklingt, treten die Hauptthemen des Satzes wieder hervor, und das Solo der Viola beschließt den Satz poetisch. Das Scherzo ist vielleicht der pittoreskeste Satz, und es ist auch der am stärksten überarbeitete. Es beginnt lebhaft mit Fragmenten von Themen, die vom Orchester hin- und hergeworfen werden. Ein fugato-Abschnitt ist getragener. Der Scherzo-Teil wird wiederholt und ein Fagott verbindet ihn mit dem Trio (in C-Dur); dieses evoziert auf lebendige Weise eine heitere Cockney-Szene, die von einer Mundharmonika (gedämpfte Hörner) und einem Pianoakkordeon gebildet wird. Die Ausgelassenheit weicht einer dunkleren, beinahe düsteren Behandlung der Hauptthemen. Horn und Violinensolo führen diese elegische Richtung fort, und der Satz endet in einer nachdenklichen Stimmung. Das Finale öffnet mit einem tragischen appassionato-Thema, einem Hilferuf gleich. Cellos leiten ein langsames Marschthema ein. Dieses geht direkt in einen munteren allegro-Teil über, der von einem feierlichen Thema für Streicher und Hörner dominiert ist. Zweifellos sind es einige der bittereren Aspekte des Stadtlebens—die Hungermärsche, die Elendsviertel—, die als Inspiration für diesen Teil der Sinfonie dienten. Das Marschthema baut sich auf zu einem leidenschaftlichen Höhepunkt, seine letzte Aussage ist gekrönt von einem Gongschlag. Der dreiviertelstündige Westminsterschlag erklingt, und der Epilog setzt ein mit einer plätschernden Figur, die uns verrät, dass die Themse das Subjekt ist. Der Komponist sagte, der Epilog sei von einer Passage aus H. G. Wells’ Roman Tono-Bungay angeregt. Darin wird London aus der Perspektive eines Kriegsschiffes beschrieben, das den Fluss in Richtung Meer hinunterfährt: „Dort auf der Themse entlangzufahren ist so, als würde man die Hand über die Seiten eines Buches über England fahren lassen, vom Anfang bis zum Ende. Die alten Rufe und alten Bekenntnisse ziehen vorbei, querab achtern, versinken über dem Horizont—vorbei, vorbei. Der Fluss geht vorbei—London geht vorbei, England geht vorbei …“ Fragmente vorheriger Themen werden in Erinnerung gerufen. Nach einem finalen, elegischen Violinensolo und feierlichen Akkorden schwillt die Musik an zu einem ruhigen—und gleichsam prophetischen—Ende. Sechs Monate nach der Uraufführung stand England im Krieg mit Deutschland, und der 42-jährige Komponist von A London Symphony hatte sich zum Dienst in der Armee gemeldet.